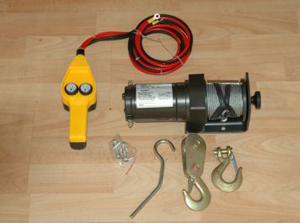 DRE have been supplying 2000lb 12-volt Winches for over 20 years. The 2000lb Winches are supplied at our workshop situated in Bunclody Co. Wexford Ireland, at the Wexford, Wicklow and Carlow borders. LONGHORN 12-volt winch with 2000lbs pulling power. Supplied with a remote cable for forward and reverse. Also comes with a pulley and hook. Absolutely ideal for launching or loading a boat, pulling your car our of the mud oreven pulling out tree stumps. We've even had a customer buy one to mount on his 4x4 quad bike. Call us, you can pay over the phone and we'll deliver direct to your door.